A new study tracks the “rain” of charged water particles into the atmosphere of Saturn and finds there is more of it and it falls across larger areas of the planet than previously thought. The study, whose observations were funded by NASA and whose analysis was led by the University of Leicester, England, reveals that the rain influences the composition and temperature structure of parts of Saturn’s upper atmosphere. The ring rain’s effect occurs in Saturn’s ionosphere, where charged particles are produced when the otherwise neutral atmosphere is exposed to a flow of energetic particles or solar radiation. When the scientists tracked the pattern of emissions of a particular hydrogen ion with three protons (triatomic hydrogen), they expected to see a uniform, planet-wide infrared glow. What they observed instead was a series of light and dark bands — with areas of reduced emission corresponding to water-dense portions of Saturn’s rings and areas of high emission corresponding to gaps in the rings. 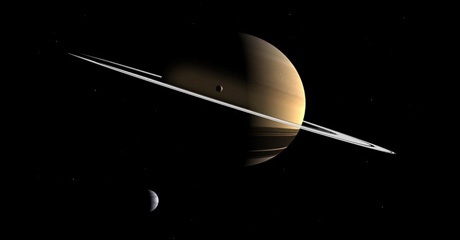 This artist’s conception illustrates how charged water particles flow into the Saturnian atmosphere from the planet’s rings, causing a reduction in atmospheric brightness.